NEAUA - Do Accountable Care Organizations Impact Prostate Cancer Screening? Do Accountable Care Organizations Impact Prostate Cancer Screening? BACKGROUND: Accountable care organizations (ACO) are an alternative payment model designed to reduce low value care and financially incentivize efficient, coordinated care. In this model, rather than paying individual providers based on the volume of care -ACO are reimbursed at the level of the institution, with incentives for providing high quality care. Prostate cancer screening is a service with large variations in utilization and controversy regarding value of care—especially among men over 70. 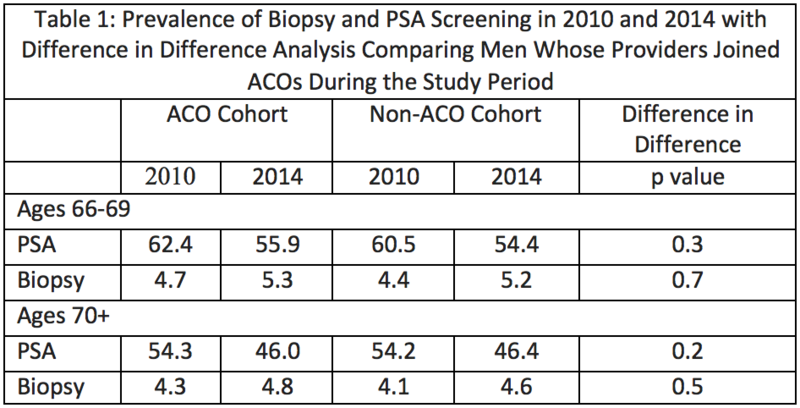 We analyzed trends in PSA screening and prostate biopsies of American men depending on whether their providers joined ACOs. METHODS: We relied on Medicare claims data to identify hospitals and providers who joined ACOs between 2010 and 2014. We examined whether trends in PSA and biopsy rates from 2010 to 2104 were different in men whose primary care providers were ACO-affiliated versus those with non-ACO affiliated providers. Inverse-probability weighting and difference-in-differences analyses were utilized to compare utilization of both screening tests. Analyses were stratified by age groups: 1) 66-69 and 2) ≥70. RESULTS: For those providers whose primary care providers joined ACOs between 2010 and 2014, the prevalence of PSA screening for men aged 66-69 declined from 62.4% to 55.9%. Non-ACO affiliated providers also had a similar decline in rates of PSA screening from 62.4% to 55.9%. Trends in biopsy rates were similar in both groups: 4.7% to 5.3% from 2010 to 2014 in ACOs and 4.6% to 5.3% in non-ACOs. The difference-in-differences analyses showed that the change in use of PSA from 2010 to 2014 was not significantly different at ACOs and non-ACOs (p=0.3). Similarly the trend in use of biopsies from 2010 to 2014 was not significantly different in ACOs and non-ACOs (p=0.7). Similar non-significant differences were observed when the analyses were performed in those aged ≥70 years old (Table 1). CONCLUSIONS: Overall, the trend in PSA screening and biopsies from 2010 to 2014 was similar at both ACO and non-ACO affiliated providers, and this was true regardless of patient age. This suggests that the implementation of ACO status did not have an impact on the use of PSA screening or biopsy, including in older age ranges where PSA screening is generally considered to be lower value.